The Shermans, a band I know locally from Brentwood, have released their second EP "LUNA". After their first foray into recording with "Marina", which you can read my review of here, they have changed studio and upped their game. The songs here are more coherent in the nature of the band, and are definitely an improvement. The vocals have improved, not due to the singer Callum Quirk, but the recording quality that they found in their new studio - less effects and clearer melodys help push the songs along fluidly. The lyrics are better too, whether it be Callum or the rest of the bands input, but they are noticeable: on "Since I Lost The Summer", Callum croons: "I've been thinking way too much, memoirs, snapshots I can't touch". The emotionally connecting lyrics of the chorus: "You don't know what it's been like/this time apart just don't feel right" could easily be a hit at festival across the country, let alone pubs in Essex. The variety on the album is noticeable, but less stark than the previous EP - they have found their sound. "Like A Fool", with it's reminiscent sound to Jake Bugg, is catchy at the same time it is developed. Clever music and lyrics are to to be found all across the album, something I particularly look out for. The bass and drums are truly exceptional on this album - as is the rest of the band, but it was already evident on the last album. Jake on bass dances around notes on "Like A Fool", and Alex introduces some "indie" drumming with a cowbell on "Since I Lost The Summer", my personal favourite, that you can hear below, along with "Like A Fool". If I had to criticize the album, which I don't really want/have to, the songs perhaps are a bit safe, and would fit perfectly on an album rather than a fan grabbing EP. 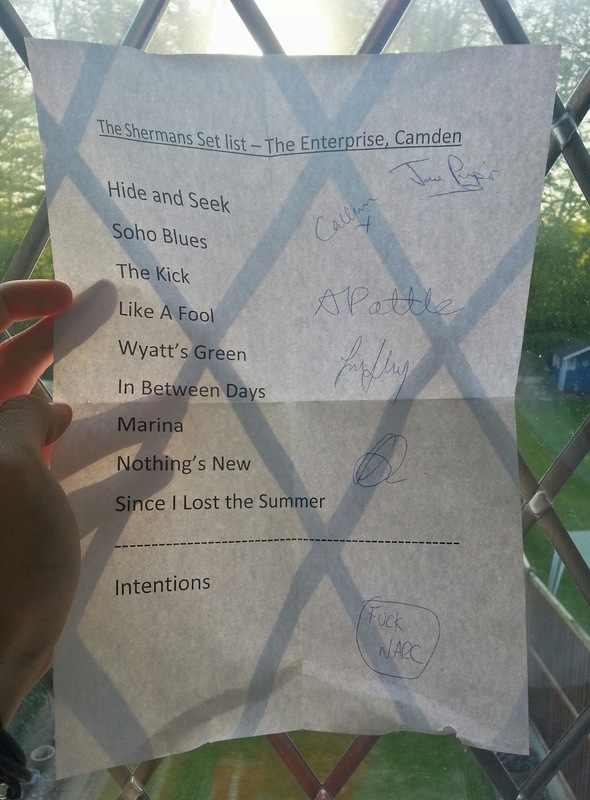 Their setlist for the now infamous record-company-that-doesn't-deserve-credit in Camden! Hide and Seek has hidden itself we have seen! Overall, the progress is rewarding, for the listener and the band. For the listener there is great music to delve into; for the band, great things to come. You can follow them on Twitter here, or soundcloud below for their latest and past releases.